A William Hill Scottish Cup draw descended into farce for the second time in under two years last night when Brora Rangers were called out twice. Fifteen ties had already been drawn at Montrose’s Links Park by Archie Knox and Derek Sim, chairman of Links Park Community Trust, when Sim called out number 9 for Brora Rangers. He was quickly advised it was a 6 but Sim insisted it was a 9 and live coverage of the draw on the SFA’s Facebook page was cut as Brora had already been given a home tie against Queen’s Park. The entire draw was re-done in an incident mirroring the 2016 quarter-final draw where when one of the balls containing the club names split open before it was pulled out. 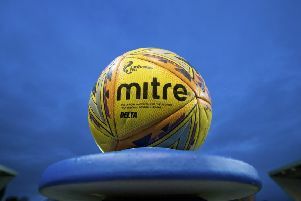 When the draw was finally carried out correctly East of Scotland League minnows Lothian Thistle Hutchison Vale were rewarded for their shock 5-3 win at Stirling Albion with a tie against Championship leaders St Mirren. Stirling had led through Darren Smith but Jamie Devlin equalised and Sean Wringe headed home before the 15 minute mark for the Edinburgh visitors. Wringe scored again and Louis Swanson netted a penalty before Devlin made it 5-1. Peter MacDonald and Scott Davidson pulled goals back for Stirling but it was too late. Cowdenbeath are also out after losing 1-0 to visitors East Kilbride where Sean Winter hit the winner four minutes from time. Peterhead had no problems against amateur visitors Colville Park, with Rory McAllister scoring five times in a 9-0 win. Berwick Rangers defeated Annan Athletic 1-0 at Shielfield with Pat Scullion volleying home in the second half. Gavin Price’s first game as Elgin City manager was successful as his side saw off Edusport Academy 3-1 at Borough Briggs. Clyde’s won 3-0 at Keith thanks to second half goals from Smart Osadolor, Max Wright and Darren Ramsay. Montrose enjoyed a 4-1 win over Stirling University where an early double from Craig Johnston eased their passage. Cove Rangers secured a 2-1 win at Nairn County, Buckie Thistle defeated BSC Glasgow 6-2 with John McLeod scoring twice and Willie West’s brace was enough for Fraserburgh to win 2-0 at Edinburgh University. Archie Macphee also hit a double as Formartine saw off East Stirlingshire 4-0. David Greenhill and Jamie Dishington each scored twice as Spartans cruised past Clachnacuddin 5-0. Two Junior sides progressed, with Banks O’Dee defeating Selkirk 2-0 and Glenafton winning by the same score at Deveronvale.